The main highlight of this release is the support for .NET Standard 2.0 and ASP.NET Core. New features also make getting started with WebSharper easier than ever: * With dotnet templates, creating a new C# or F# WebSharper project is now done in a single command line. WebSharper configuration for a project is now stored in a simple JSON file. in Visual Studio 2017, from the downloads page. You can also add WebSharper to an existing project. Simply add the NuGet package WebSharper.FSharp or WebSharper.CSharp (depending on your language of choice) and add a wsconfig.json file. Now, let's see the changes that are coming in this release. WebSharper's built-in libraries, as well as the entire library of standard extensions, are now available for .NET Standard 2.0. This means that you can now run WebSharper applications on .NET Core 2.0 on Windows, OS X and Linux. WebSharper.Web.RpcModule and WebSharper.Sitelets.HttpModule are only available for .NET Framework. WebSharper.Web.Control inherits from System.Web.UI.Control in .NET Framework, and from System.Object in .NET Standard. WebSharper.Core.Resources.HtmlTextWriter inherits from System.Web.UI.HtmlTextWriter in .NET Framework, and from System.IO.TextWriter in .NET Standard. WebSharper.Sitelets.IHostedWebsite, which builds a sitelet from a System.Web.HttpApplication, is only available in .NET Framework. // ... and pass it to WebSharper. // ... and use it in the application. dotnet new websharper-web This creates a Client-Server ASP.NET Core web project. dotnet new websharper-spa This creates a Single-Page Application project. It is hosted in an ASP.NET Core project, so that you can quickly run it as well as serve RPCs to your SPA. dotnet new websharper-lib This creates a simple WebSharper-compiled library. dotnet new websharper-html This creates a static generated website. Read the full documentation about wsconfig.json. 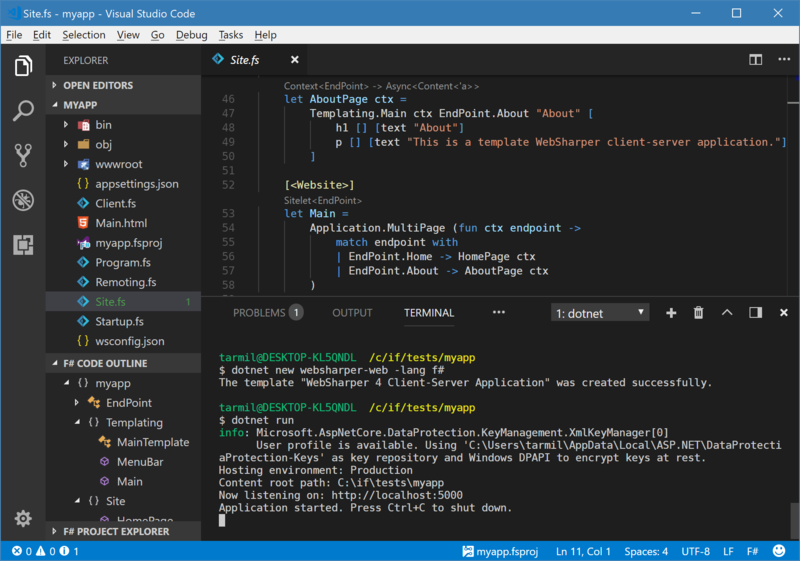 The F# tooling extension for Visual Studio Code, Ionide, provides code completion for wsconfig.json. Updated FSharp.Compiler.Service to version 20.0.1, which makes compilation faster. Support C# 7.2 language features: reference semantics with value types, non-trailing named arguments. A new compilation mode, bundleOnly, allows faster compilation of SPA projects by skipping some parts of the C# or F# compilation that are unnecessary if you don't reference this project from other .NET projects. Use it by setting "project": "bundleOnly" in wsconfig.json, or <WebSharperProject>BundleOnly</WebSharperProject> in your . *proj file if you are not using wsconfig.json. View.WithInit init view creates a View that immediately returns a given initial value init if the input view is still awaiting. let userInput = Var.Create "world"
|> View.WithInit "Deciding how to greet you..."
Similarly, `View.WithInitOption view` immediately returns `None` if the input `view` is still awaiting, then returns `Some` once `view` has a value. Attr.DynamicClass's API was inconsistent with other Attr. * functions: it was a generic function taking a View<'T> and a mapping function 'T -> bool, rather than directly a View<bool>. It is now deprecated, and the new Attr.DynamicClassPred has the more standard behavior. Additionally, the new `Attr.ClassPred` is equivalent to `DynamicClassPred` but takes its argument as a `bool` rather than a `View<bool>` and is reactive when using `.V`. It is now the recommended way to create a class that is reactively set or unset. let currentPage = Var.Create "home"